The Orang Utan species in Sabah is one of the most precious and well preserved fauna species in the country. Both the local government and the local society had been figuring all sorts of way to protect and take care of the Orang Utan in the country so that the species can be able to live for a longer time and in the same time, it is hope that the future generations of the country can have a chance to still see these Orang Utan – the treasure of Malaysia. If you are also interested to catch a glimpse and know more of this animal species in Sabah, the recommended place for you to visit is the Sepilok Orang Utan Sanctuary. The Sepilok Orang Utan Sanctuary has a long history dated back to the year of 1964 on the protection and preservation of the animal species in the state. Under the direct supervision of the local government (Wildlife Department of Sabah), the place had did a great job in making sure that the Orang Utan in the country can have a habitat close to their nature so that they can stay comfortably away from harm. In here, you will obtain the opportunity to observe the daily lifestyles of the Orang Utan in a very close distance. By visiting here, it also means that you would not need to explore forests or mountains just to catch sight of the Orang Utan in the state. As the place is located in the forest, you will also be guaranteed safety when you are observing the Orang Utan in the forest. 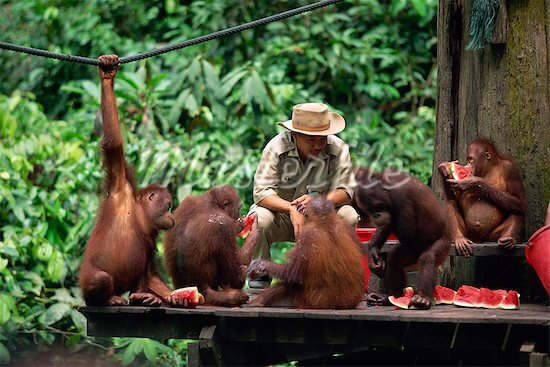 It is definitely a close to nature experience in which you can gain extra knowledge on the Orang Utan species. Along the long boardwalk, you will also be able to observe other elements in the forest which will help you understand more of the other flora and fauna species in the state. There is also a special gallery in the place which can help you learn more of the Orang Utan species. Here, you can have a close up look on the way the Orang Utan feed their babies, which is a very precious opportunity you will never get even when you head into the forest by yourself. You can also find other endangered species such as the rhinoceros in the Sepilok Orang Utan Sanctuary. With the supporting objective to protect the wildlife in Sabah, this sanctuary will also help you realize the importance of protecting these endangered species, as they are also part of the residents in this world.